Here is another review from a product I tried out. I needed a new foundation because my other one that I have is almost empty. And because my skin is a little more tanned than usual I wanted a shade that is a little bit darker so I don’t have to use much other products. But because I wouldn’t use a darker one that much, I didn’t want to spend much money on it, so I wanted to try one from the drugstore. I went for one from Rimmel because I heard a lot of people talk about it. 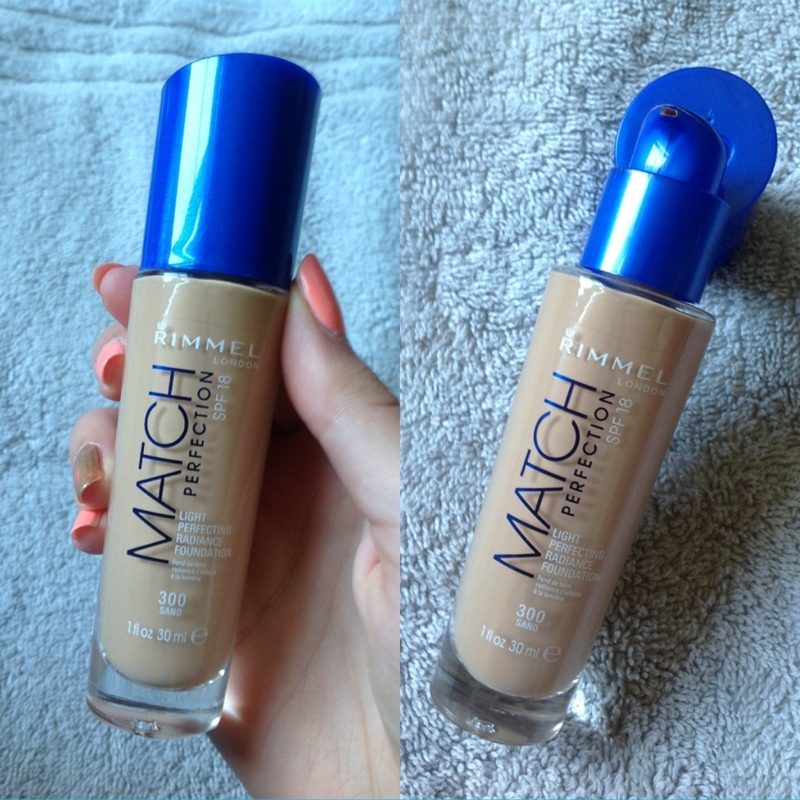 Finally I got the Rimmel Match Perfection – Light Perfecting Radiance Foundation. At first I wanted to try the Wake My Up one, but I tried it out and there is some glitter in it, and because I do tend to have a more oily skin I didn’t want to have that little bit of glitter in it. So that’s why I tried one of the other ones. I am surprised that it is quiet a good one. I personally don’t need to apply that much. I think it has a good coverage. I would say medium to full, but it’s not quit yet there. I give it a medium+. When I first apply it, it has a bit of a rose undertone, but it blends out really well to a nice skin color. I have pretty red cheeks of my own and after a thin layer it is pretty much completely covered. It can be applied with your hands or a brush. I personally prefer to use a brush because sometimes it is easier to reach some places and it gives a more even finish. It also has SPF in it, which makes it interesting to use during summer. And another plus is that it doesn’t break me out. There are a few colors in the range, but it is rather limited. But if you don’t find your matching color, you can blend 2 colors to match your skin tone. I chose for the color 300-Sand because it is a little bit darker. There are of course better foundations, but for this price it is a very good one. It gets the job pretty well done. I give it an 8 out of 10. This entry was posted in beauty, Product review and tagged foundation, Review, rimmel by missnathaliexo. Bookmark the permalink.